Shades of Gray: How Far Would You Go? When I first began reading Shades of Gray, I had no idea of what to expect in terms of the events to occur. All I knew was that a man would become desperate to save his daughter. From what, I didn't know. It wasn't long before I caught a glimpse of the loving relationship between John and his young daughter, Lucy. I enjoyed their interactions and found myself waiting for the proverbial axe to fall, or shadow to cross their door. All too soon, I learned that Lucy was ill and in need of a transplant - a procedure which would cost more than John could afford with no health insurance. At that point, exploring his options and considering his pride, John became desperate to save his daughter - and that is where the title, Shades of Gray - so aptly named - comes into play. Offered a way to get the necessary funds in hopes of saving his daughter's life, John strikes a deal with Wanda, a woman you would never expect a law-abiding citizen to become entangled with. Even then, the redeeming qualities present in Wanda made me feel sorry for her lot in life - made me wish that she and her daughter could escape from such a hellish, dangerous life. On a personal note, like John, I am a law-abiding citizen who lives a clean, simple life. I prefer to stay out of trouble and to pay my bills on time. Like John, if circumstances forced me to do so, I'd probably decide which bills had the highest level of importance, thus needing to be paid immediately and which bills could wait until next time. I would not be one to turn to the streets to make money, whether by selling my body or through providing illegal drugs or substances, directly or indirectly. Like John, I have a daughter. In fact, I have two of them. I also have a son and an infant grandson and granddaughter. Right now, all is black and white. There are things I will always do and things I will always avoid. However, unlike John, neither of my children or grandchildren have been diagnosed with a terminal illness. What if they were? What would I do? Would I continue seeing a path consisting solely of black and white or would I become so desperate as to begin justifying shades of gray? Even several months after reading the last page of the story, this question still burns in my mind. Note: when writing this review, it was not my intention to give the story away by telling you everything that happened in each of the characters' lives, how so many of the circumstances could have been avoided had different decisions been made. My intent was to share how the book affected me from an emotional standpoint, especially as a parent; it made me realize how quickly life could change, how convictions could be persuaded in light of circumstances - especially those involving the health and well-being of our children. Shades of Gray is a rich story in its portrayal of characters and the ultimate sacrifice a parent is sometimes forced to make in order to protect their child. The ending is one I will never forget and I will be sure to look for other titles written by Andy Holloman. 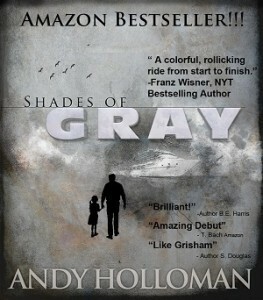 If you would like to learn more about Shades of Gray or would even like to purchase your own copy, just click the book cover. It will take you to the book's page on Amazon.